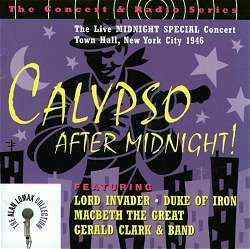 The Midnight Special concert series was launched by Alan Lomax and Peoples Songs in the fall of 1946, with the intention, as Lomax told the New York Times, of cover[ing] the whole field of American folk music systematically. The concerts began at 11.30 pm, thus enabling the organisers to hire the New York Town Hall cheaply. (I bet that today a booking for that hour of the night would attract premium rates, given the additional overtime, energy, and security costs.) These two CDs reissue the calypso concert of 21/22 December 1946, which is said in the notes to be the only one known to have been recorded. I would be surprised if Alan Lomax were as unsystematic as that, and indeed there is reason to think, as I have shown in Blues & Rhythm, that at least portions of the blues and boogie concert of 1/2 March 1947 (with Big Bill Broonzy, Memphis Slim, Sonny Boy Williamson, James P. Johnson and Sidney Bechet!) may have been recorded. Be that as it may, its still remarkable that the dozen ten minute discs containing the present recordings survived in a closet for over 50 years, to be found when Lomaxs sister Bess was packing up to move house. These unpromising storage conditions seem to have affected the recordings not at all, and it sounds as if they were never played before being forgotten about. As a result, the sound quality of the CDs is, all things considered, extremely good, although some allowance has to be made for the placement of microphones; Gerald Clarks band sounds a bit distant at times, and his own guitar playing is almost entirely inaudible. We do get to hear his cultivated speaking voice on the first disc, though, for what that may be worth as compensation; I doubt that many listeners will find it as valuable as annotators Donald Hill and John Cowley appear to. With its faithful inclusion and transcription of all the announcements, dialogues, and blowing into microphones, this CD might be thought to be less important as entertainment than as evidence for historians of the time when progressive politics and folk music were joined, or, more soberly, of how radical politics, ethnomusicology and folk music interacted. (Im not one who works much in that area, but for those who are, I offer a correction to the transcriptions: the Christmas hootenanny which Lomax announces was to feature, not Johnny Falk [sic], but Hally Faulk, in other words, Hally Wood, who was married to John Henry Faulk at that time.) The Town Hall concert is indeed important as a historical document, but it also survives its 50 years in the closet, to emerge as a very enjoyable listening experience. One of the advantages of laser technology over stylus and groove is that the listener can skip over interview and dialogue tracks, but these two CDs are among the few where the repetition of such material doesnt rapidly become tedious. Alan Lomax keeps things moving briskly, paints evocative word pictures of Trinidadian life and music, and elicits interesting commentary from the singers. He also introduces the band at one point: First, Hi Clark on the double bass in the back. Victor Pacheco on the fiddle, the violin. Gerald Clark, Gerald Clark the leader on the guitar. Albert Morris on the piano. And Gregory Felix, whos the man whos playing all of that clarinet. The musicians then play Im a Better Woman than You, and for once we can hear clearly just what a great band they were. (sound clip) All the singers and musicians involved clearly felt that this was a big night for calypso, and came determined to give of their best. As a result, these two CDs are both entertaining and instructive, exactly the outcome which Alan Lomax was hoping for when he set up the Midnight Special series all those years ago.